As part of this ‘book(ish) tour, I’m hoping to meet people – readers, writers and shy people who love the page. Among the most loving and generous has been the organisers and volunteers of the Footpath Library – the only free library for homeless people in Australia. 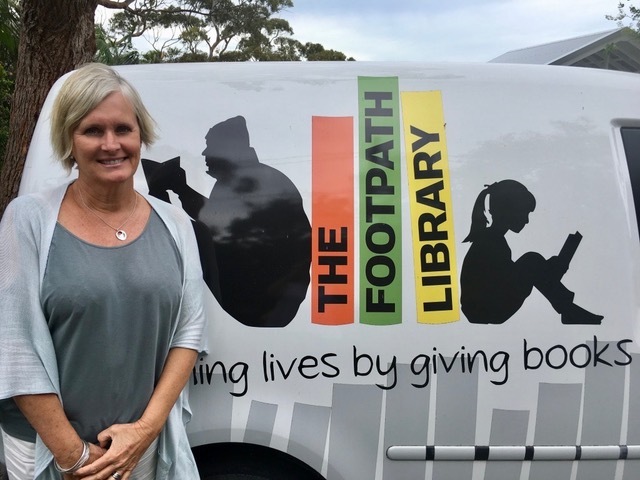 Started in 2003, The Footpath Library currently operates from a van Sydney and a fixed address in Perth. There are plans to start a mobile service in Melbourne. In Sydney, the library operates in Martin Place on Tuesday nights. The library collaborates with other homelessness services such as Orange Sky Laundry – (a laundry service which allows homeless people to do their washing) and Vinnies Night Patrol which providing tea, coffee and soup. Together they create a regular event in which homeless people can come together for nourishment and shared community. The Footpath Library also provide free books to a variety of homeless shelters. “We provide food for the mind,” says Sarah, “An escape from the self that’s not harmful.” I imagine for someone suffering the stresses of homelessness, these books are a blessed relief. The library is not in competition with public lending libraries, which Sarah recognises provide a great resource for the homeless that includes a range of services such as free access to the internet and books which can be read in a dry and safe environment. But to borrow a book, to take it away, requires an address which can be prohibitive and fines for losing a book can become burdensome to someone who is indigent. There’s a lot of voluntary support for this beautiful idea, which, like all charities, has running costs including cataloguing, accountancy, reporting, and maintenance of both the stock and the vans. They’re currently not accepting books from the public due to storage difficulties, but they are still providing their services, so if you’d like to support this beautiful charity – particularly this Christmas – click here to make a financial donation. You can also follow them on Facebook to learn more about their activities. I’m volunteering to help out in Perth on the 10th of December at Wellington Square from 8:30AM. Thanks to Sarah Garnett for being my first interview on my Book(ish) tour.